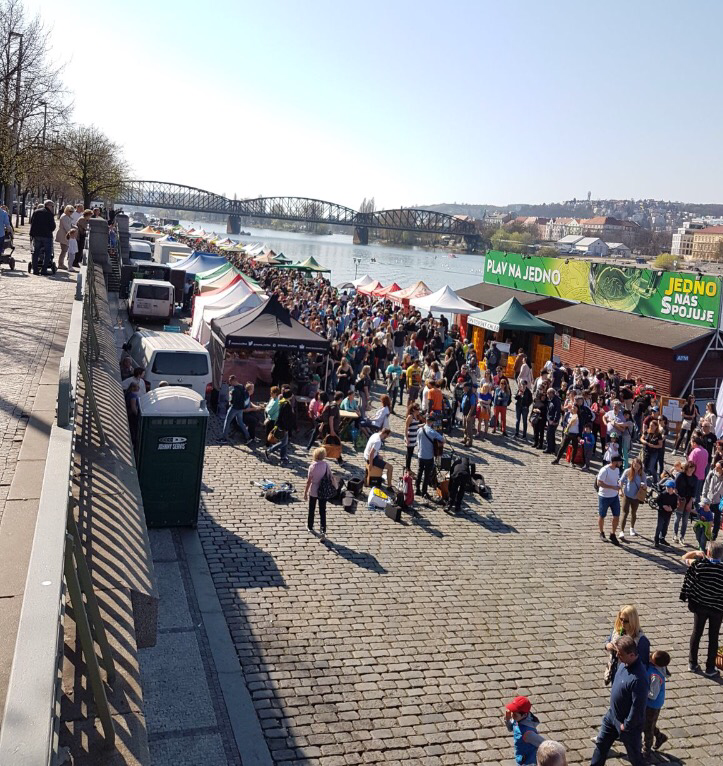 It was my first visit to the Czech Republic back at the end of March this year, my first new country of 2017! After returning back to work after the Christmas break, a trip was needed to ease the new year blues. With my colleague and friend Sofyanah, Prague was decided on, as it was somewhere neither of us had been before. The £110 return flight from Leeds wasn’t too bad price wise, and along with our 3 nights in an Air B&B place, we paid around £200 each for the long weekend. The beginning of feeling unwell! A few days before we flew I started with a rash on my hands. By the morning of the day we were flying the rash had flared up more and my throat was sore. However, I was trying to fight through it, I was looking forward to my weekend away. After a trip to the Pharmacist they thought it was an allergic reaction and gave me some anti-histamine. It was a sign of things to come when I wasn’t even interested in the traditional pre-holiday airport drink. One of the advantages of staying at an Air B&B place, is that many offer airport pickup at similar costs to catching public transport. 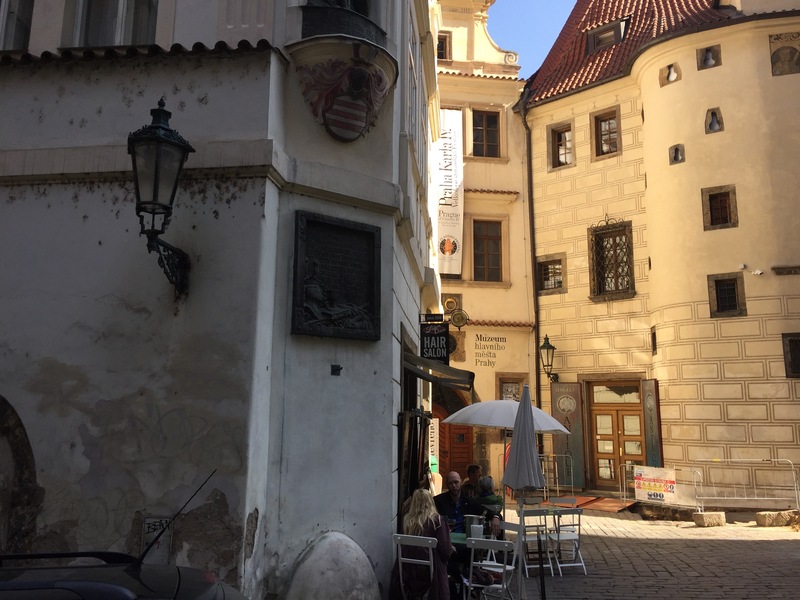 This was the case in Prague, our pickup was pre-arranged with the owner, and we were driven straight to our accommodation whilst given some insights into local history from our driver. 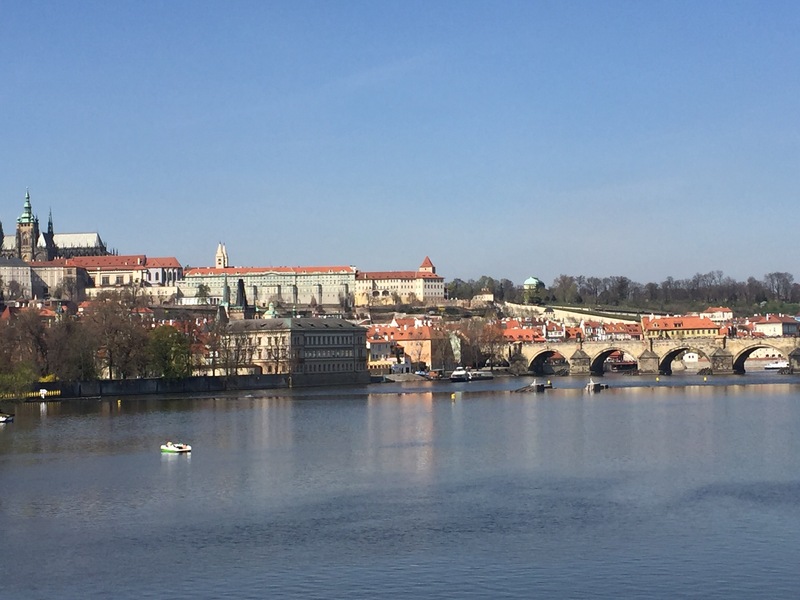 The plan wasn’t to stay in the Old Town at all, we were meant to stay the full 3 nights over the other side of the city towards Charles Bridge. However, as I’m sure many of you know, mistakes do happen when booking trips, no matter how experience a traveller you are! On the morning of our flight I woke up to an email from our Air B&B host Katka confirming how to get into the property, directions etc. It was only then that I noticed we were only staying with them for 2 nights, starting from the day after we flew. Mild panic set in as I sprung out of bed. Firstly I tried Katka to see if there was availability for us to stay a night early. Unfortunately there wasn’t. 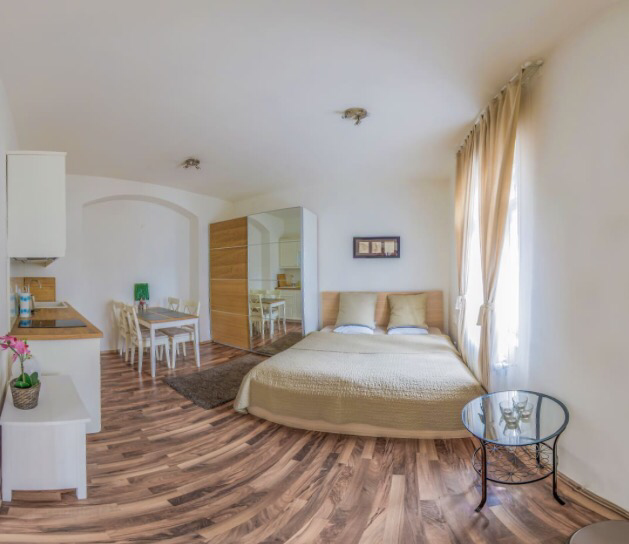 I then started looking at other Air B&Bs in Prague and came across Peters place in The Old Town https://www.airbnb.co.uk/rooms/4893138. It was basically a bed sit but it looked clean and there were some good reviews, so I booked it, phew! This was the first, and hopefully the last time I mess up travel accommodation! Staying a night in the old town actually worked out great. There were lots of places to eat and drink and we were nearby to the main attractions. After checking in to our self-contained flat in Peters courtyard we went for a stroll around. After attempting to eat in a number of places with waiting times of over an hour just to be seated, we opted for pizza. Still feeling unwell we headed back to our flat after eating, I dosed myself up with drugs and had an early night. I wasn’t feeling any better in the morning, but kept fighting through it, I was on holiday I wanted to get out and explore. We didn’t need to check out of Peters until midday so decided on doing some sightseeing heading towards the Old Town Square. 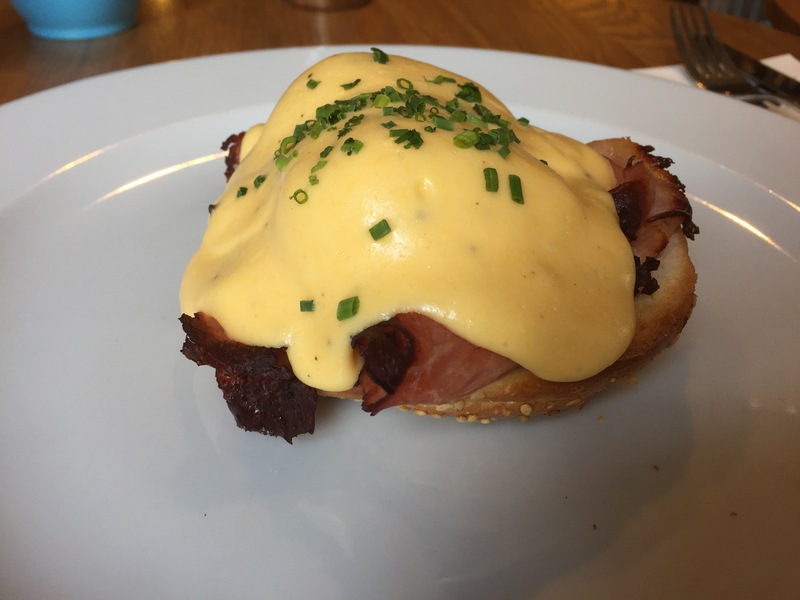 En-route we paused for breakfast at a lovely bistro called La Bottega https://bistroteka.lacollezione.cz/en. 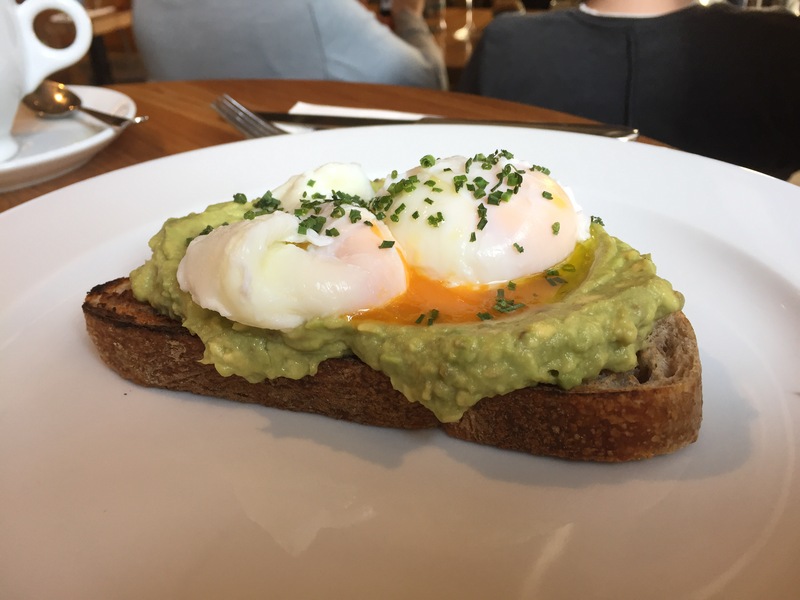 I had Eggs Royal, whilst Sofyanah, who is just as obsessed with food as I am by the way, opted for the smashed avocado and poached eggs on toast. Both dishes vanished fairly swiftly. The rest of the morning we spent wandering around the buildings and winding side streets of the old town. 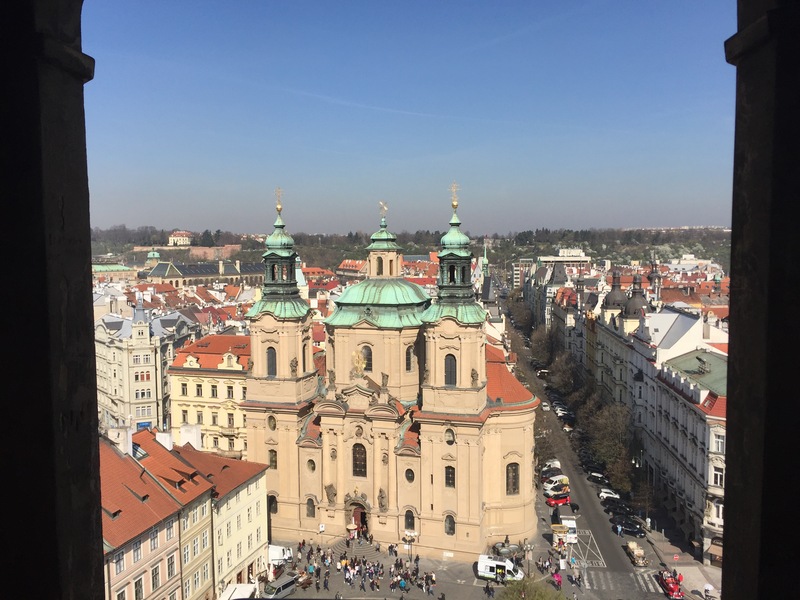 In the main square we listened to some local musicians playing, then walked up to the top of the tower which had the most incredible views of the city, it felt like you were in a fairy tale. 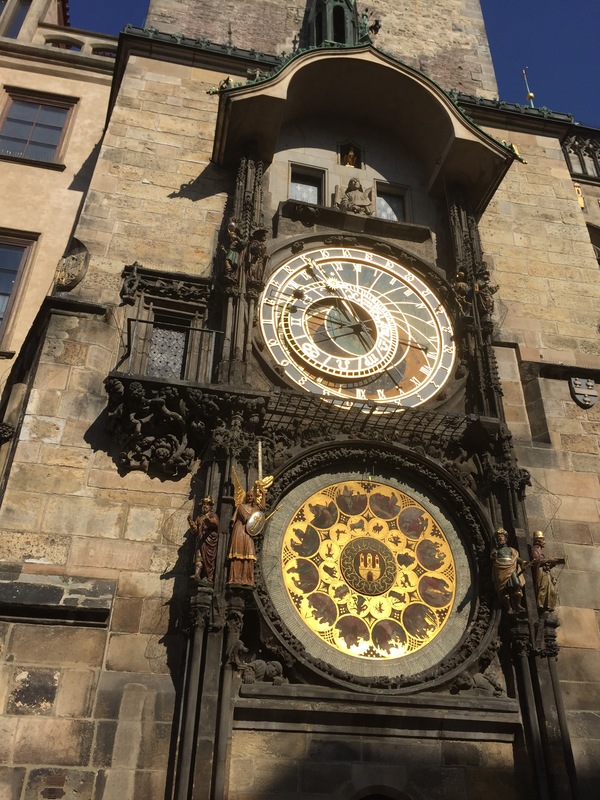 At the side of the tower was the Astronomical Clock, which was eye catching if not overcrowded with hundreds of tourists, we quickly moved on. 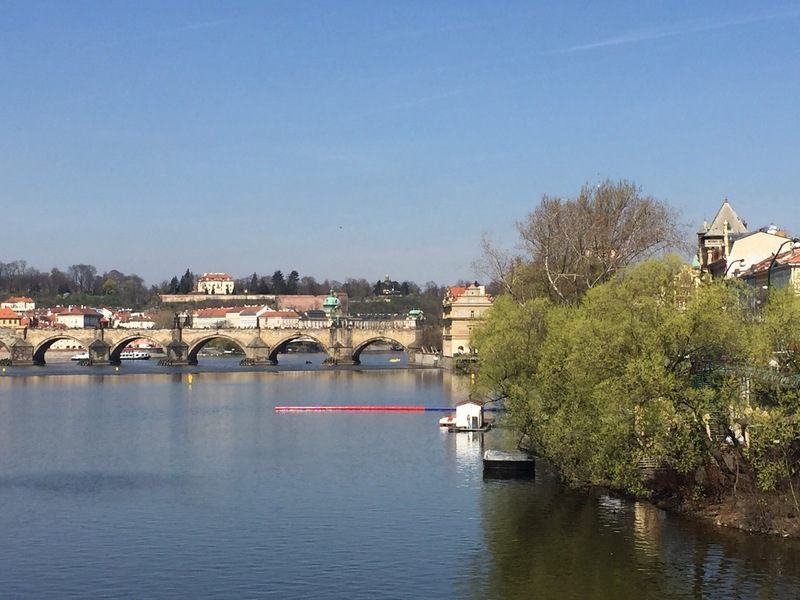 After checking out from Peter’s, we walked over towards the Vltava river which we had to cross to reach Katka’s place. 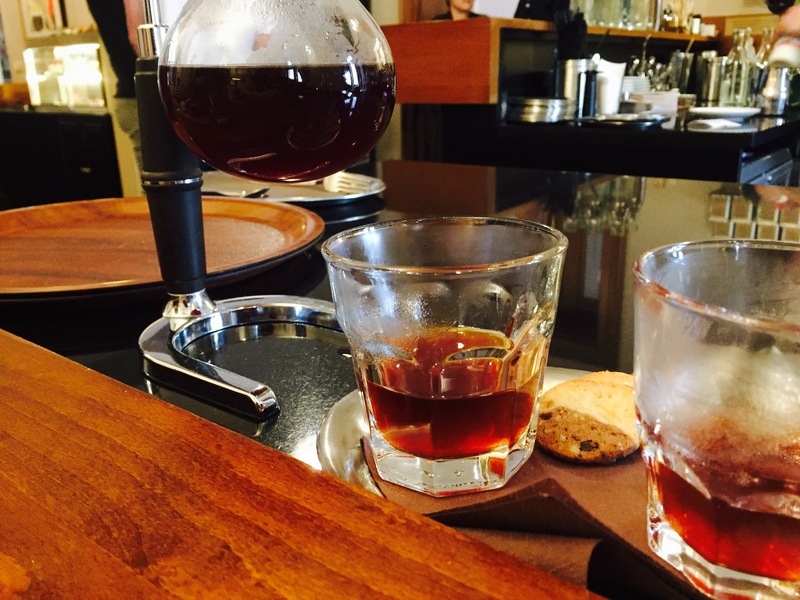 Feeling hungry once more we stopped off at a traditional Czech cafe Narodni Kavarna http://www.narodnikavarna.cz. 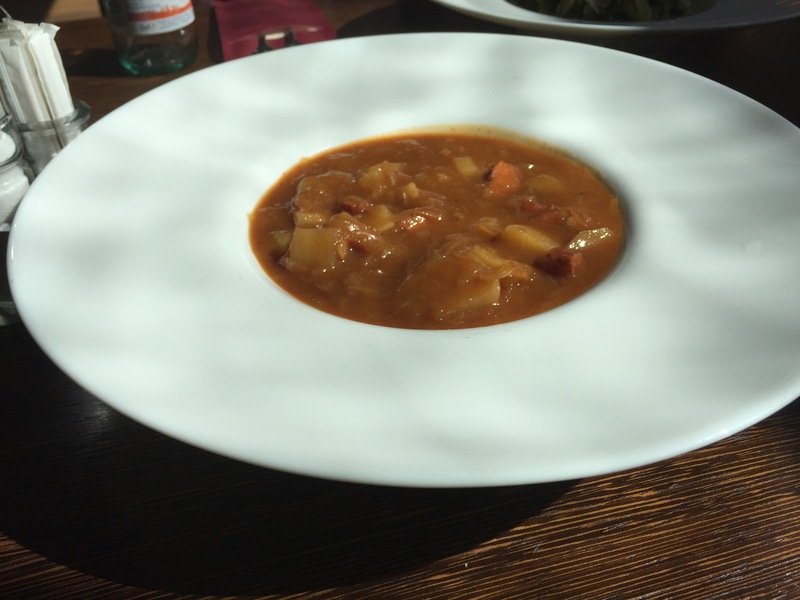 I tried a local dish of Cabbage & Sausage Soup with a Plum Jam, it was delicious. The weather was unusually warm for the time of year, which would have been perfect for siting outside in the sun drinking a cold crisp beer or two. However, my body had other ideas. I went for a lie down as soon as we got in the flat as I was starting to feel worse. Around three hours later I woke up and my throat felt like it was closing up. 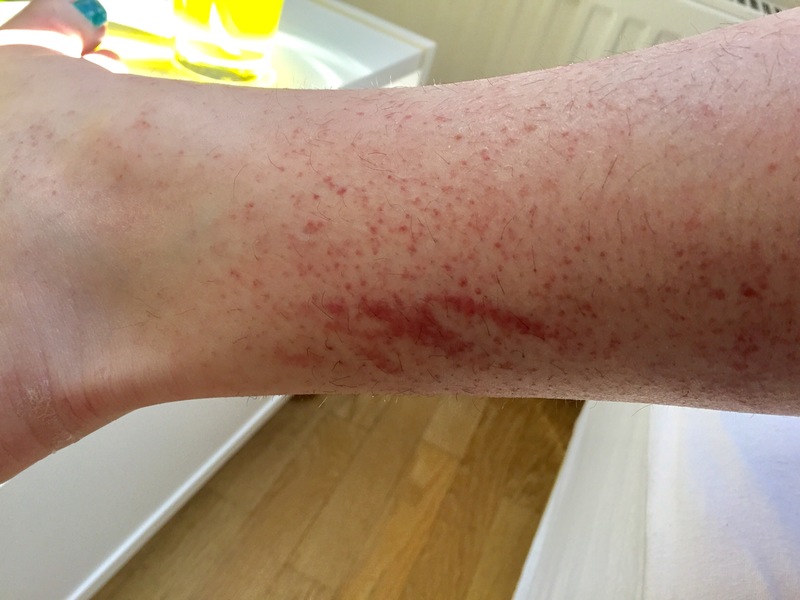 I looked at my rash and it has spread all over my legs, to my stomach and my chest. I was hospitalised with sepsis a few years earlier and I was experiencing similar symptoms. I knew that I needed to see a Doctor. It was early evening by this time, so out of hours had started. 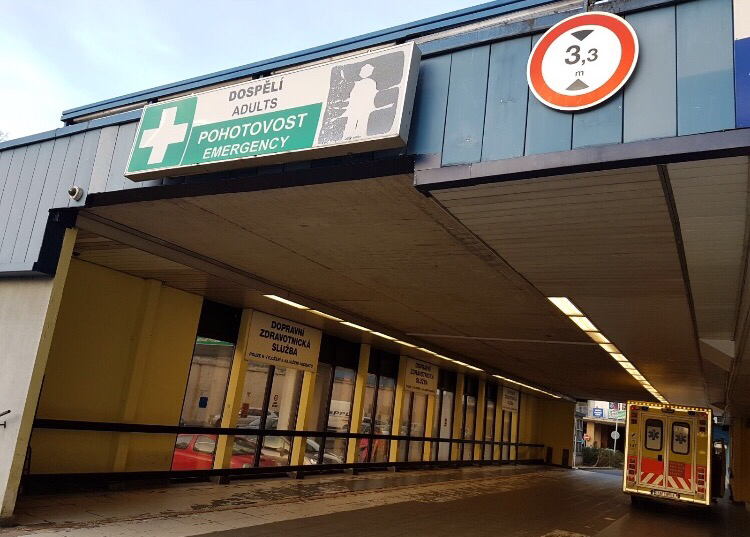 I rang Katka and she told me which hospital I needed to go to, along with a taxi number to call, and we were on our way. Around 10 minutes later we arrived at the A&E department. After a brief discussion with the receptionist we were directed to what was actually called the ‘Foreigners Department’. After completing a form I was asked for my EU Medical Card, Passport and insurance details, which I thankfully had on me. I was directed back downstairs and sat in the general A&E waiting area. It was getting pretty busy by now, however after only 5 minutes of being there I was called into a medical bay. I was gone for over two hours, poor Sofyanah wasn’t allowed to come in with me, so she was sat outside worrying all that time. I’ve never seen anyone look so relived when I walked back out to see her. The diagnosis was acute laryngitis. Blood tests came back negative for sepsis thankfully, my throat however was physically closing up so I was given something for this, plus a calcium drip for the rash, and a good strong intravenous pain relief (which lasted a few days!). The good news was that all the treatment was entirely free, UK citizens, make use of your EU Medical cards whilst you still can! After sleeping until 2pm the following day, I was determined to walk out somewhere to see some more of the sights. 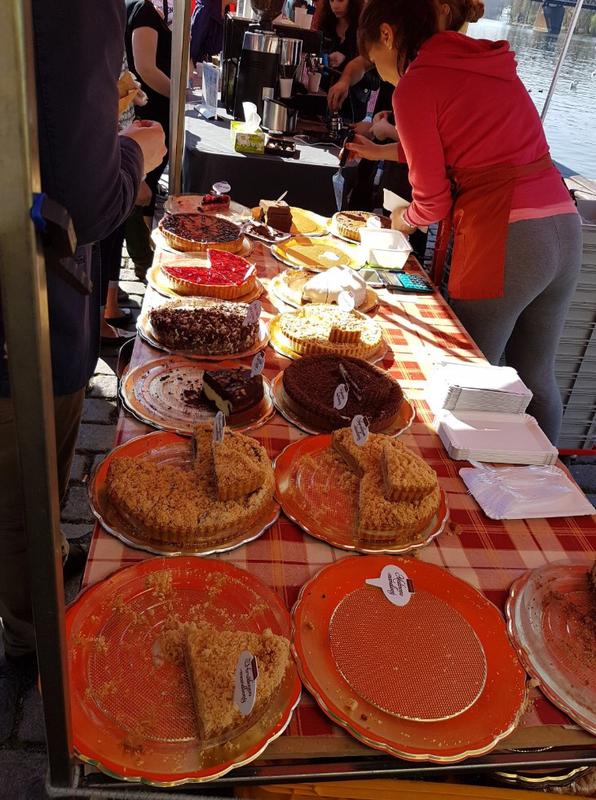 Sofyanah visited the local farmers markets that morning on the opposite side of the Vltava river, bringing back some treats for lunch. These markets are on every Saturday morning. Fortunately I hadn’t lost my appetite, that would have sent me over the edge! 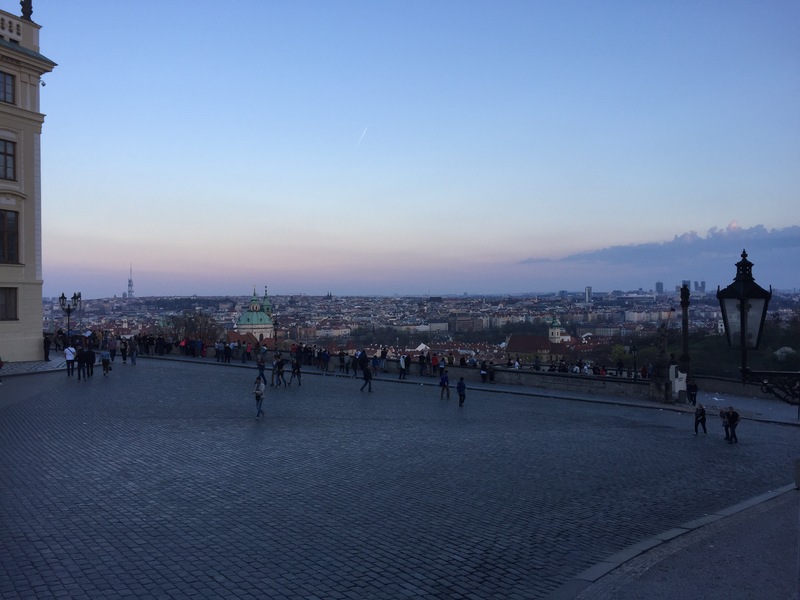 Early that evening we slowly walked up to Prague Castle via the Lennon wall. Once a relatively normal wall until shortly after John Lennon’s death in 1980, the wall has since been filled with Lennon-inspired graffiti and pieces of lyrics from Beatles’ songs. Despite the authorities repeatedly painting over the wall, they never succeeded to keep it clean for long. 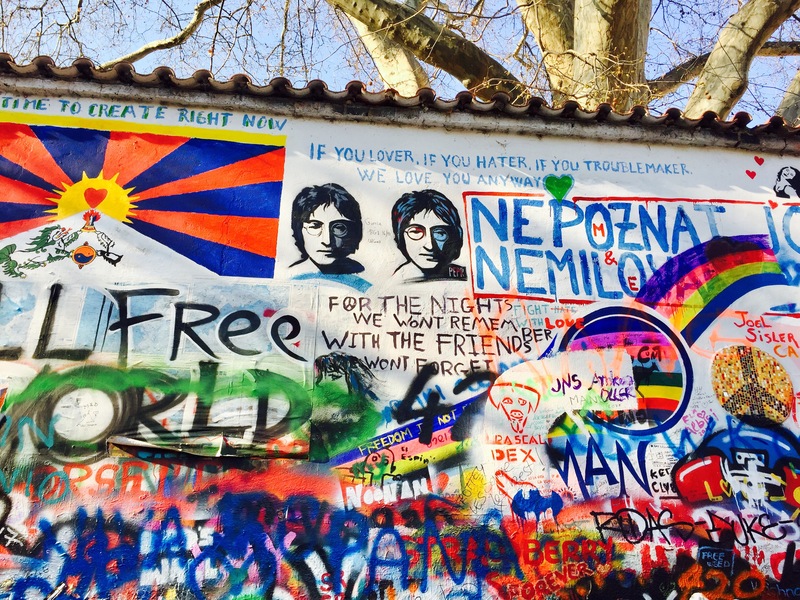 The wall soon became a political focus for Prague youth. Western pop music was banned for a while by the Czech communist regime, with a number of local musicians being jailed for playing such music. These days though buskers and musicians are regularly heard playing The Beatles and John Lennon hits besides the wall, which was the case when we visited. 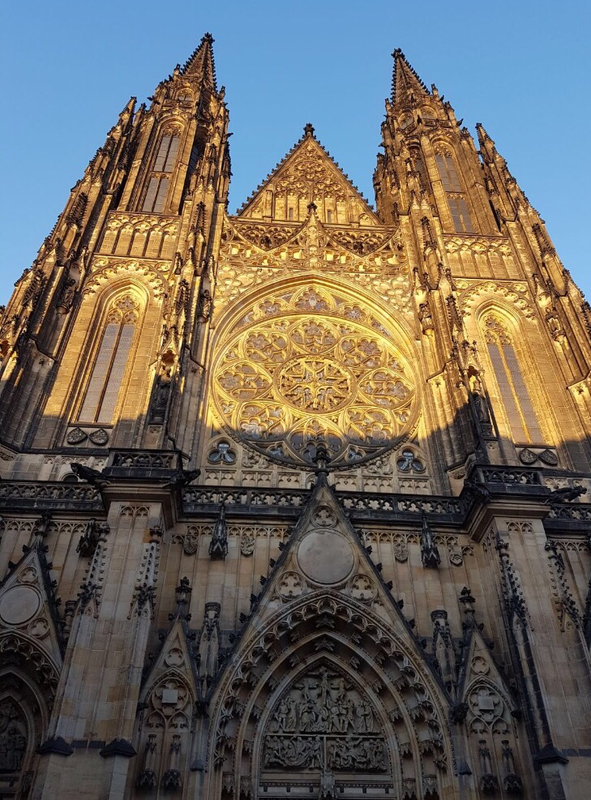 We finally made it up to Prague Castle as dusk fell, managing to take in the beautiful views of the sun setting over the city. 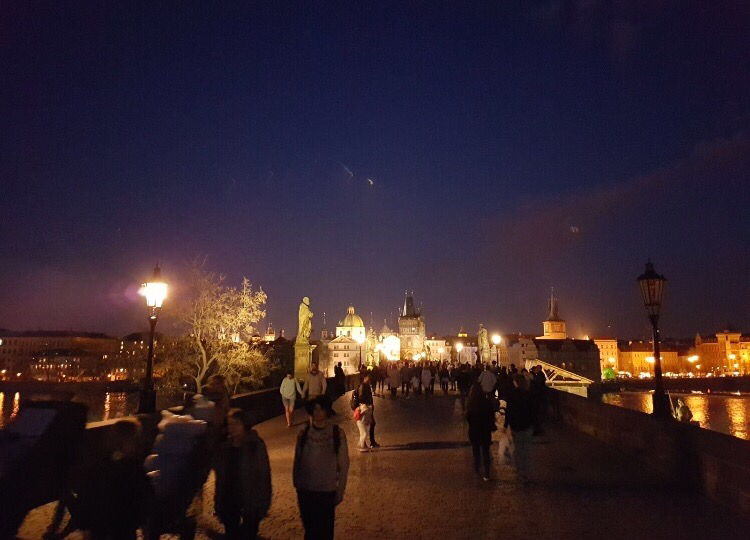 Feeling pretty exhausted it was an early night as we headed backwards to our apartment via Charles Bridge. I was slightly envious watching people in bars enjoying their Saturday nights, however the tiredness soon took over my envy. Check out was by 10am the next day however our flight wasn’t until later that evening. 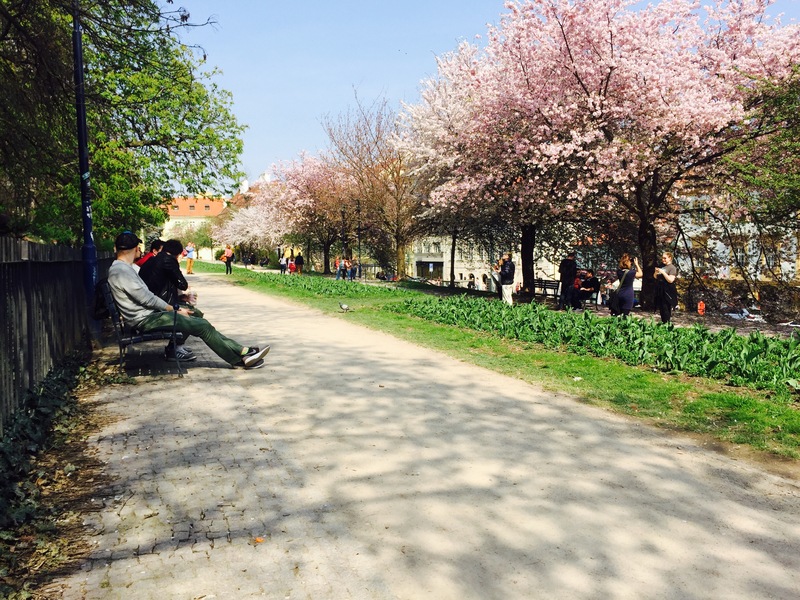 The warm weather enabled us to find a spot in nearby Petrin Gardens where I managed to get some more rest. Enroute to the park we stopped off for breakfast at Cafe Lounge http://www.cafe-lounge.cz/ which had been recommended to us by Katka. 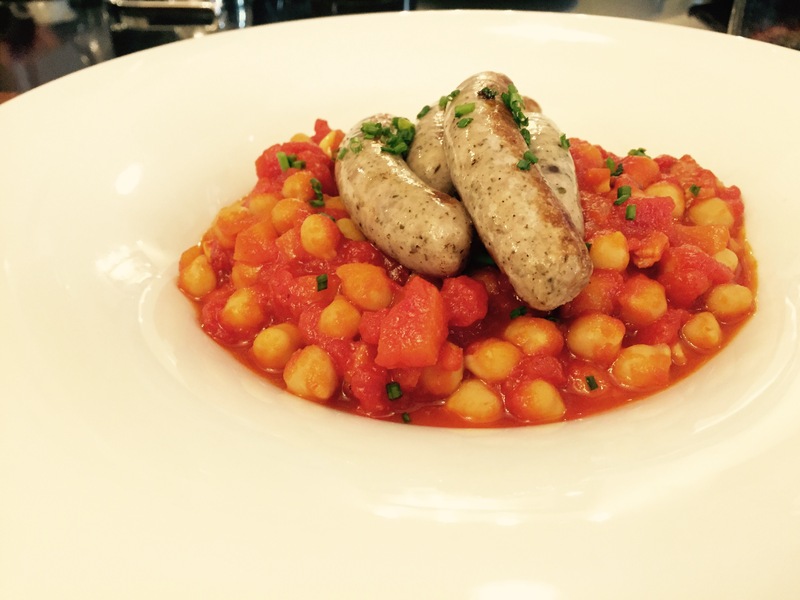 I had a tomato and bean stew served with sausages, and a coffee that was filtered through a type of glass bunsen burner device. Despite frustratingly not feeling well during the trip, I still feel as though we saw a lot of the city. I would like to go back to Prague again to take advantage of all the cheap European beer! Oh, and a big thanks to Sofyanah for being an excellent Nurse and feeder! Previous Post My summer so far: Dublin, Northern Ireland, First Tattoo, Hen Doo, Wedding and Next Supper Club Confirmed!